Consider two sizes of disk, both of mass M. One size of disk has radius R; the other has radius 2R. System A consists of two of the larger disks rigidly connected to each other with a common axis of rotation. System B consists of one of the larger disks and a number of the smaller disks rigidly connected with a common axis of rotation. If the moment of inertia for system A equals the moment of inertia for system B, how many of the smaller disks are in system B? This is College physics Answers with Shaun Dychko. We have two disks of equal mass, one disk having a radius of r and the other having a radius of two times r. System A consists of two disks stacked on top of each other and the drawing I've shown here is a cross-section where they have a common axis of rotation in the middle there and they're stacked on top of each other like pancakes. In system B we have a single disk of radius two r and then below it are a whole bunch of disks of radius one r. The question is how many disks are in the stack? So we know that the moment of inertia of the two systems are the same we're told. So we'll make a formula for the moment of inertia of system A. This is the formula for moment of inertia of a single disk, it's mass times its radius squared divided by two and I plugged in two r for the radius because that's the radius of these large disks. That two r is squared which will make four r squared and these two's cancel here, giving us the final formula for the moment of inertia of system A as four m r squared. 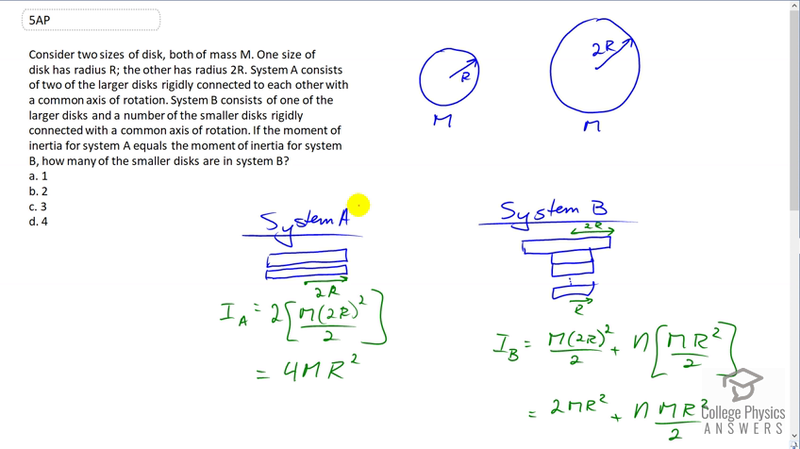 For system B, we have the single large disk, mass times its radius which is two r, squared, over two and then we have to add to that some unknown number, we'll call it letter n, of these smaller disks which each have a moment of inertia of m r squared over two. Then we square this two r here. It makes r squared and that makes four on the top, but then the four divided by two becomes two. We didn't really do anything there and then we'll equate these two moment of inertia formulas. So we have two m r squared plus n m rsquared over two equals four m r squared. We can divide both sides by m r squared, so let's multiply by one over m r squared here. m r squareds cancel. We're left with two plus n over two equals four. Then subtract two from both sides and we have n over two equals two. Multiply both sides by two and we get n is four. So there are four small disks in system B. So the answer is D.